My favorite image from the current issue of Lonny - Ashley Putnam's Houston home. I've been in fits looking at this house...I want it. I'm especially impressed by the use of so many dark tones, and yet the house feels open, young and welcoming - quite the balancing act. I know we've heard it all across blogland, but this issue of Lonny is super good - I'll be "leafing" through it a couple more times before I'm over it. We've got quite the busy social calendar this weekend, so there will be little rest but lots of fun. Hope you all have a stellar weekend...see you Monday! Ashley's home was one of my favorites as well. I'm wondering what the paint color is on the walls. I love it! Her home was by far my favorite. I love the blue and white! I've already gone through this issue twice, and feel the need to go through it again! I loved this particular home, it really spoke to me. I really do need to get on board with Lonny. I just cannot get into the whole online magazine thing with stacks of shelter mags piling up on my desk. I posted my own "crush" today but called it inspiration so as not to steal your weekly title. Have a great weekend. This was my favorite image as well. 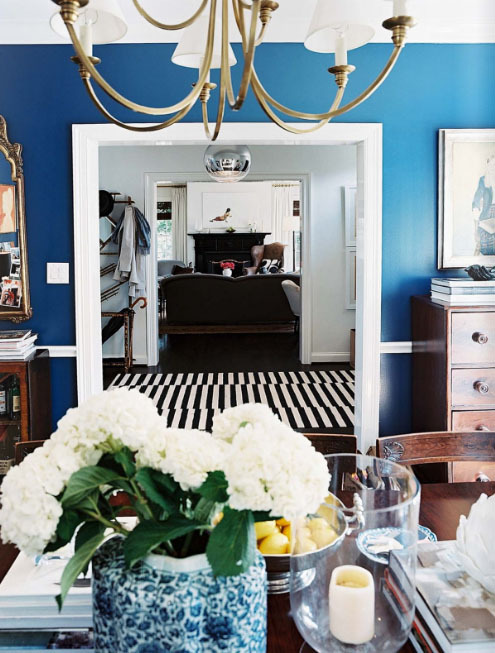 That blue dining room is dynamite. I love everything about this photo- it is set up beautifully!